Energy of the Past, Energy of the Future – Where Are We Heading? The sixth year of the Czech-German Young Professionals Program (CGYPP) was opened in Prague and Ostrava. 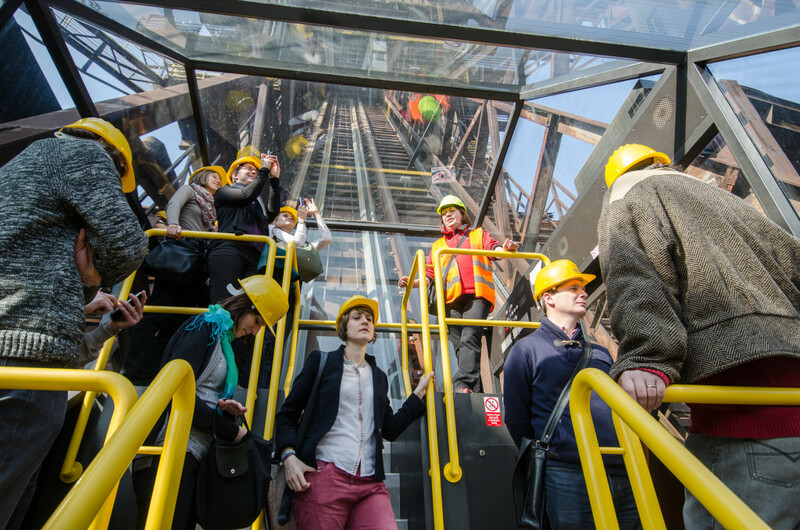 Young professionals on site visit of the Vítkovice Lower Area in Ostrava. During the opening event we have discussed economic and political implications of the current development in energy policy in the Czech Republic and Germany. The discussion with Václav Bartuška (Ministry of Foreign Affairs of the Czech Republic), Michael Kehr (Net4Gas), and Ulrike Wolf (Bavarian Ministry of Economic Affairs and Media, Energy and Technology) dealt with different approaches to energy policies in both states. All speakers stressed the importance of clear political leadership towards technical and political (Energiewende) as well as geopolitical (Russia) challenges. In addition to these issues, the debate focused also on public discourse and its consequences on individual technical projects. Often, these projects don’t increase mutual understanding but cause the reverse results; such as interconnectors of electricity between Germany and the Czech Republic. In the second part of the workshop which took place in Ostrava we have oriented on regional implications on changing energy policy as well as impacts in heavy industry field. To get a broader picture of the topic, we have experienced the shift from heavy industry to modern culture industry thanks to on-site visit of the Vítkovice Lower Area. This unique area shows how a vision can re-shape the function and purpose of the former industry area. The idea of reviving of the area while simultaneously keeping its genius loci was discussed with Petr Koudela, the director of Lower Area. Yet a different perspective on restructuring of mining and heavy industry in Europe was brought by Viktor Mácha, an industrial photographer who travelled Europe and former Soviet Union countries to document the withering steel works and the its beauty of sui generis. Mácha suggested that the heavy industry in Ostrava region should be running as a kind of social responsibility project (rather than purely profit-oriented). For getting a complex picture of the current energy policies, we have organized discussion with nuclear energy expert, František Heczko, currently based in Switzerland. His presentation had a clear tenor: Germany will struggle to secure a stable energy supply if it closes all nuclear powerplants and rely largely on renewable. In his opinion, Energiewene is an adventurous if not a dangerous project. In the last part of the seminar, we have discussed the development of the Ostrava with local representatives. We met entrepreneurs running their own start-up business and later we had a working dinner with Jan Sedláček, Member of Parliament for ANO 2011 Movement. In both cases we could get their perspectives of regional development that is burdened by heavy industry heritage. Besides their frank local patriotism, they also revealed many problems: the lack of mutual communication, mistrust to political solution weak cooperation with Poland etc. The last part of the seminar was dedicated to the internal workshop of the CGYPP participants, focusing on their biggest challenge in their professional and/or personal life. For this purpose the participants had to use the Pecha Kucha form.